Florida state reptile is the alligator. In 1987 the Florida legislature designated the American alligator as the official state reptile. Alligators are found throughout Florida and in parts of other southeastern states. They prefer lakes, swamps, canals, and other wetland habitats. 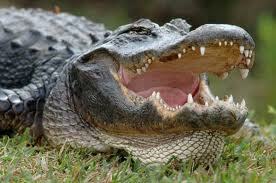 Alligators eat fish, turtles, and a variety of other animals. In late June and early July, female alligators usually lay thirty to fifty eggs in mound-shaped nests made of reeds and other vegetation. Baby alligators hatch after an incubation period of about two months. 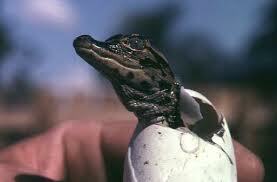 When hatched, alligators ar e already fully developed and about eight inches long. Mature alligators usually range from six to twelve feet in length, with females rarely exceeding nine feet. Because alligators are cold-blooded, we often see them sunning on logs or on banks near water. Gators can move surprisingly fast over short distances, and their powerful jaws and swinging tails make them dangerous to approach. Female alligators are particularly aggressive when guarding their nests. Alligators should not be fed, since this causes them to lose their fear of humans, and feeding is against Florida statutes.